7:13 - The game is final after Air Force attempts several laterals before being tackled. Navy wins 48-45 and moves to 5-0 and can win the Commander-In-Chief’s Trophy with a win over Army on December 9. 7:10 - Air Force has the ball on their own 25 with 15 seconds remaining in the game. 7:05 - Navy has the ball on the AF 16 with 25 seconds left in the game. 7:02 - Navy facing a 4th and 2 on their own 32 and complete a 25 yard pass to Brandon Colon. 7:00 - Navy starts at their own 25. 6:57 - Worthman finds Bennett wide open for a 51 yard TD pass giving AF the lead. After the PAT, Air Force leads Navy 45-41 with 1:53 left in the game. Air Forces scoring drive was 2-57-0:35. 6:56 - Air Force starts on their own 43 yard line down 3 to Navy with 2:28 remaining. 6:55 - Air Force forces Navy to punt from their own 29 with 2:34 left in the game. 6:50 - Navy faces a key drive starting on their own 25 and leading Air Force by 3 with 4:09 left in the game. Today’s matchup is the highest scoring game in the history of the Navy-Air Force rivalry. 6:48 - Tim McVey found the end zone after a 2 yard run. The Falcon scoring drive was 5-75-1:59. With 4:09 remaining in the game, Navy leads Air Force 41-38. 6:46 - As ArionWorthman took a big hit, he complete a 60 yard pass to Ronald Cleveland to the Navy 15. 6:41 - Navy decides to kick the field goal and Bennett Moehring makes the 25 yard field goal. With 6:08 remaining in the fourth quarter, Navy leads Air Force 41-31. Navy’s scoring drive was 10-52-5:20. 6:38 - Navy faces a 4th and 1 on the Air Force 7 with 6:13 remaining in the game. 6:34 - Perry carries the ball 14 yards to the Air Force 32. 6:30 - On the kickoff, Malcolm Perry collides with a teammate then returns the ball 33 yards to the 41. 6:24 - Geraud Sanders completes a 24 yard pass to Worthman to the Navy 3. On the next play, Worthman runs it in for a Falcon TD. Air Force’s scoring drive was 8-89-3:26. With 11:28 remaining in the game, Navy leads Air Force, 38-31. 6:21 - Worthman completes a 22 yard pass to Bennett. Then he completes a pass to Garrett for 10 yards. The Falcons follow that up with a 24 yard reverse by Cleveland to the Navy 19. 6:19 - Navy is forced to punt and AF fair catches the ball at the AF 11. 6:15 - The third quarter ends with Navy facing a 4th and 15. The Mids lead Air Force 38-24. 6:10 - Zach Abey carries the ball three times in the current drive gaining 45 yards. Abey now has 174 yards on the ground today. 6:03 - Arion Worthman carries the ball for a one yard TD cutting Navy’s lead to 38-24. The Air Force scoring drive was 11-73-4:44. Navy holds a 2 TD advantage with 4:30 remaining in the third quarter. 5:50 - Zach Abey counters Air Force with a 75 yard TD run. Navy leads Air Force 38-17 with 9:14 remaining in the third quarter. Navy’s scoring drive was 1-75-0:12. Zach Abey now has 142 yards on 16 carries. Today marks his 6th straight 100 yard game going back to last season. His 6 consecutive 100 yard gams ties him for third in school history. The record is seven. 5:45 - Tim McVey carries the ball 6 yards for an Air Force TD. Air Force’s scoring drive was 4-73-1:30. With 9:26 remaining in the third quarter, Navy leads Air Force 31-17. 5:43 - Arion Worthman carries the ball 52 yards to the Navy 21. 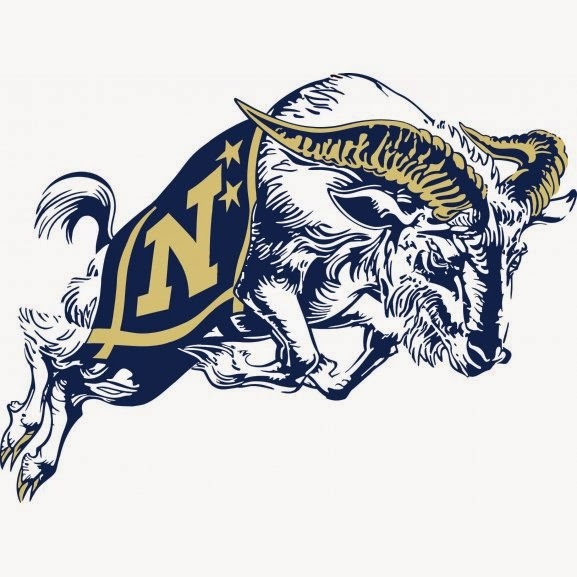 5:38 - Bennett Moehring kicks a 21 yard field goal to give Navy a 31-10 lead over Air Force with 10:56 remaining in the third quarter. Navy’s scoring drive was 8-61-4:04. 5:35 - Darryl Bonner takes a Zach Abey pitch 38 yards to the Air Force 7. 5:32 - Navy takes Air Force’s kickoff to start the second half at their 35 yard line when the kickoff goes out of bounds. 5:12 - Worthman runs the ball 14 yards to the Navy 9. Luke Strebel kicked a 26 yard FG as time expired. Air Force’s scoring drive was 11-55-1:52. Navy leads Air Force, 28-10 at halftime. 5:03 - Worthman carries the ball 11 yards on third-and-10 to the Navy 32. There is 0:55 remaining in the first half. 5:00 - Worthman carries the ball 22 yards to the 43 yard line. 4:56 - DJ Palmore picked up an Air Force fumble and returned it 41 yards to the Air Force 40 yard line. Two plays later Abey hit Malcolm Perry for a 40 yard TD completion. Moehring made the PAT. With 1:52 remaining in the half, Navy leads Air Force 28-7. Navy’s scoring drive was 2-40-0:14. 4:46 - Abey scores from one yard out giving Navy a 21-7 lead following Moehring’s PAT. Navy’s scoring drive was 6-41-3:06. There is 3:45 remaining in the first half. 4:41 - Abey carries the ball for 14 yards to the Air Force one yard line. Navy now has 24 carries for 205 yards. Air Force is 19-65. 4:38 - Navy’s Jerry Thompson sacks Worthman forcing a fumble. DJ Palmore recovered on the Air Force 41 yard line. On Navy’s first play, Perry carries the ball for 22 yards to the AF 19. Perry now has 3 carries for 113 yards, his third consecutive 100 yard game. 4:36 - Air Force’s Ronald Cleveland carries the ball for 18 yards to the Air Force 29 getting the ball out of shadow of the goal post. 4:33 - Darryl Bonner takes a pitch from Zach Abey, hurdles a defender, and takes the ball into the end zone giving Navy a 14-7 lead. On the drive, Chris High carried the ball eight of Navy’s 10 plays for 34 yards. 4:19 - DJ Palmore sacks Worthman for an 11 yard loss forcing AF to punt. The punt travels 24 yards and Navy will start at the Falcons 45 yard line. 4:13 - At the end of the first quarter, the score is tied 7-7. It was an evenly played first quarter with just two yards of total offense separating the two teams - Air Force 127, Navy 125. 4:09 - It was announced that today’s attendance is 38,792 a new stadium record. The previous record was 38,225 set in 2013, also against Air Force. 4:08 - Navy is forced to punt on their ensuing drive and Air Force will take over 1st and 10 at their own 16 yard line. 3:58 - Worthman completes another long pass to Bennett, this time for a 59 yard TD. Air Force and Navy are tied at 7-7. Air Force’s scoring drive was 5-77-2:22. 3:50 - Malcolm Perry carries the ball 91 yards for a Navy TD. The TD run is tied for the 2nd longest TD run in school history. Following Bennett Moehring’s PAT, Navy leads Air Force, 7-0 with 7:52 remaining in the first quarter. Navy’s scoring drive was 1 play, 91 yards, 14 seconds. 3:45 - Arion Worthman completes a 23 yard pass to Marcus Bennett for an Air Force first down to the AF 48 yard line. The drive stalls and Air Force is forced to punt on the second drive. The punt rolls inside the Air Force 10 yard line. 3:39 - Navy forces a three-and-out on Air Forces first drive. The Falcons punt the ball to the Navy 36 yard line. 3:35 - Navy won the coin toss and deferred to the second half. Air Force will get the ball first in today’s game. The Falcons return the kickoff to their own 19. 3:33 - The Midshipmen take the field. Air Force follows soon after. 3:26 - Four F/A-18F Superhornets fly over to a great response from this sellout crowd.3:24 - The Brigade of Midshipmen are on the field. What a great tradition. 3:14 - Air Force leaves the field and the Midshipmen are ready for their march on. 1:31 - Several players from both teams have made their way onto the field to begin their pregame warmups. It’s a beautiful day here in Annapolis, 78 degrees and sunny. Today will be the first head-to-head match up in the battle for the Commander-In-Chief’s Trophy. Air Force (1-3) travels to Annapolis to take on the Midshipmen (4-0). The game at Navy-Marine Corps Memorial Stadium is a sellout and the crowd will be looking for Navy to avenge last season’s 28-14 loss to the Falcons in Colorado Springs. Air Force is led offensively by quarterback, Arion Worthman. Worthman has rushed for 250 yards and thrown for 396 yards and six touchdowns. Tim McVey is the leading rusher for Falcons with 278 yards and three TDs on the ground. Worthman’s go-to receiver is Geraud Sanders who has seven receptions for 147 yards and three touchdowns. Senior linebacker, Jack Flor is the leading tackler for Air Force. Navy enters today’s game relying on the legs of junior quarterback, Zach Abey. Abey is the leading rusher (656 yards and 7 TDs) and passer (385 yards and 3 TDs) for the Midshipmen. Fullback, Chris High is the second leading rusher for the Nation’s leading rushing attach with 288 yards and a TD. Tyler Carmona is Abey’s leading pass catcher with four receptions and two touchdowns. Sean Williams and Micah Thomas are the leading tacklers for the Mids with 29 and 25 tackles respectively. We will provide live coverage all afternoon long once the game kicks off at 3:32 PM. Thanks for the updates of the game buddy. I missed it due to my shifts and had no energy to watch the game with open eyes.